Using hardscape in your outdoor environment can increase the usable space in your backyard, add a beautiful visual element and even increase the value of your home. Whether you're creating a beautiful patio space, outdoor kitchen, walkway, or driveway, concrete patio pavers are a durable surface that looks great and can last for decades. Choosing the right concrete patio pavers for your project can be a fun experience, and today you have hundreds of styles, colors, textures, sizes, and shape to choose from. Creating your unique look has never been easier. However, with the variety of choices, it can sometimes seem a bit overwhelming. Working with a professional landscaper can help you to narrow down your options. They can offer valuable input, and provide suggestions that will meet your budget, look stunning and be highly functional. Here are some considerations to help you make the best patio paver choice for your hardscaping project! Your project will initially narrow your choices when it comes to size and shape. For example, a driveway paver will typically be thicker than one you may choose for a patio project since it will need to support the weight of one or several vehicles. Here are some ideas to help you narrow your choices further. Both look similar, but permeable pavers allow water to pass through them to reduce run-off which is helpful for areas with drainage issues. They are also more ecologically friendly as they help to filter sediment and other contaminants before allowing water to percolate back into groundwater supplies. Whether you choose brick or permeable patio pavers, both will instantly add value to your home, look amazing, and last for years. Your project will help you to narrow your stylistic choices as well. Here are several factors to consider when selecting a style. First and foremost, the architectural style of your home will affect your choice. For example, a Cape Cod style home may not look right when paired with a randomized flagstone driveway, but flagstone would be perfect in a more relaxed Craftsman style home. Similarly, brick-style pavers would look out of place paired with a modern home, but a sleek granite paver would look amazing! Existing hardscaping can also help you narrow your choices. 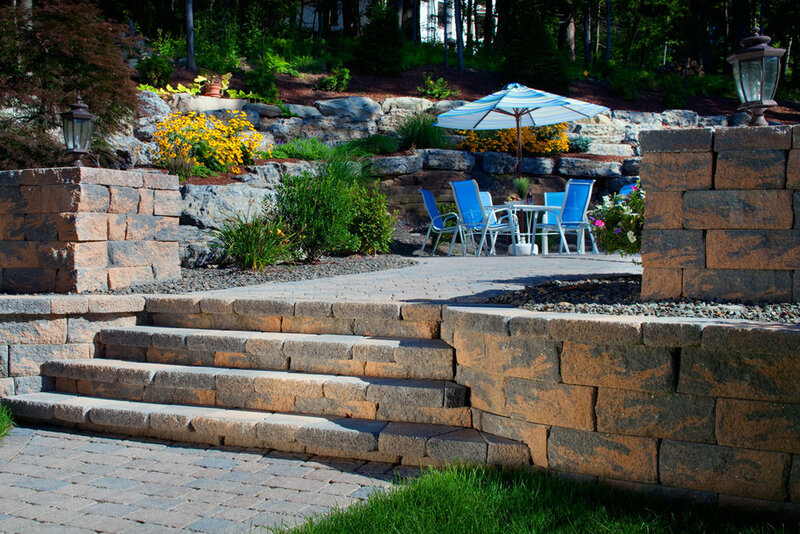 You'll want to match or compliment any existing hardscape. If you're planning a patio as a first step, choose a style of paver that doesn't limit your options if you later wish to add additional hardscaping like a fire pit, dining area, pool deck, or walkways. Some other considerations when selecting a style include color and finish. For example, a tumbled paver with uneven edges and colors may fit with your personal style. If you lean more towards a modern or contemporary look, non-tumbled pavers in a natural neutral tone with crisp edges may be more your style. Lighter colored tiles will make your space feel larger, while a dark colored paver can add a level of intimacy. Make sure whatever style you choose is consistent throughout your landscape to give it a sense of cohesiveness. Patio pavers come in a variety of textures from smooth, to weathered, embossed or even natural textures like flagstone. Your choice of texture again relies on the needs of your project. For example, smooth, rounded surfaces will work best for areas where people will be walking, like walkways, or outdoor dining areas. A slip-resistant texture is a great choice for your pool deck to keep your little ones safe. Other factors to consider are the architectural style of your home and your personal aesthetic. A textured paver should compliment the other materials you're using in your hardscape design. For example, textural contrasts can be incorporated by using accent pavers and borders. Choosing the right color can be a challenge for many homeowners. The most popular choices tend to be the earth-tones from the tan/brown/sandstone color family, to neutral grays, charcoals, and terracottas. Your homes color palette can help. Try to choose a hardscape color that goes well with your home's exterior, but don't match it. Pulling from the roof or trim colors can add a beautiful accent to your hardscaping and tie your outdoor space together. Consider mixing warm and cool colors, or using a multicolored paver to create a visual focal point. You can add more interest by bringing in additional features in contrasting colors, for example, a fire pit, border design, or free-standing wall with built-in seating. Working with a professional hardscaping contractor can make choosing the right patio paver much easier. They will sit with you, get to know your style and creative vision, ask questions to better understand your needs, and offer you suggestions and options that fit your style, needs, and budget. A professional will also have the knowledge, expertise and design skill to help you to create a functional, safe, aesthetically beautiful hardscape. They can also work with you to develop a plan for future expansion of your outdoor living space. If you're considering a hardscaping project like a paver driveway, patio or walkway for your Sonoma County home, give the experts at Bayside Pavers a call at 1-866-287-2837. We can help you design the perfect hardscape environment to meet your family's unique needs. Our knowledgeable team members are ready to help you create the outdoor living space you've been dreaming about!